Posters are up around campus reminding students to wear yellow on Friday. As a part of Yellow Ribbon Week, PALs is encouraging students to wear yellow on Friday to symbolize suicide awareness and prevention. The annual week kicked off on Monday, Sept. 10. 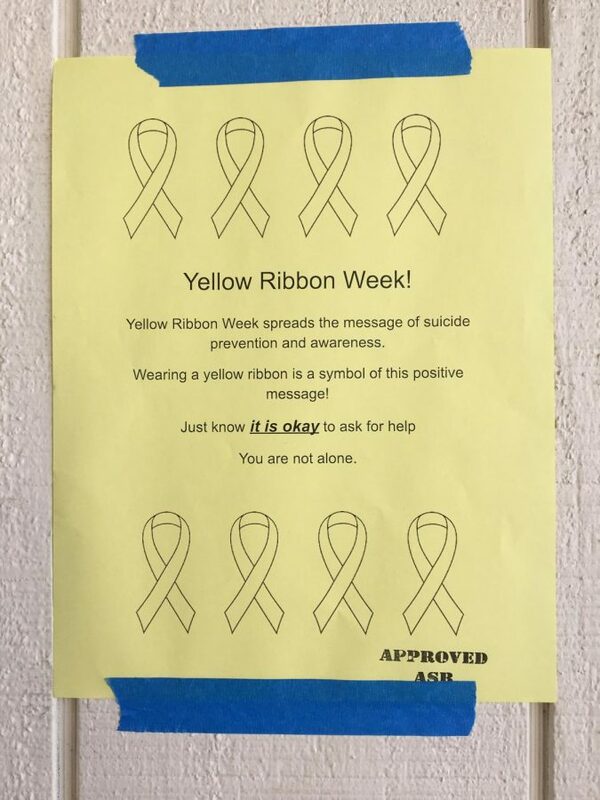 The yellow ribbon is a symbol of suicide prevention and awareness. During homeroom this week and next week, PALs will be going around and giving presentations about suicide prevention. The presentation includes advice on how to identify signs, what to do when you witness these signs of depression and suicide, and who and where to go to for help. PALs also emphasize the overall idea that it’s okay to ask for help. “…Most importantly students should recognize the importance of suicide prevention and never regard suicide as a joke or anything less than serious,” Zamora said.